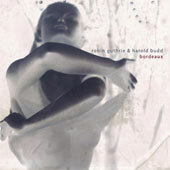 Bordeaux is the fifth album-length collaboration from Robin Guthrie and Harold Budd, and the fourth collaboration starring just the two of them. Budd plays piano that echoes and chimes, while Guthrie adds a layer of effected guitar. That's it, really: two instruments echoing slowly. Both are masters of ambient music, and i would wager that most people reading this review are familiar with at least one of them, so you should know what you are getting into here. This is an album of slow, wandering tunes made out of lush instrumentation that moves at an unhurried pace. This is music to sit on the couch and just drift away too, letting your mind wander in an unfocused manner. That is what ambient music is all about, and this is a lovely example of the genre. The album fades in slowly with Gaze Budd leading the way with meandering piano, and Guthrie adding some faint whirring guitars in the background. Deva C continues the same trend, with the guitar and piano shifting in and out of focus, trading lead position. On The Names Of Those Never Here the piano becomes a little more forceful, just slightly, driving the song along while Guthrie's guitar is a slow fuzzy whirr in the background. And then So Many Short Years Ago starts with a faint tinkling of piano and a low guitar drone that echoes and chimes in a way that reminds me of The Moon and the Melodies, Budd's 1986 collaboration with Guthrie's band Cocteau Twins. That is one of my favorite albums ever, and this tune fits right in between Memory Gongs and Why Do You Love Me?. It is one of the most beautiful songs i have heard in a long time, Budd's piano tinkling through long reverb-filled pauses, and Guthrie's guitar building to a slow tremoloed roar. It is four minutes of beauty. On The Belles of Saint Andrew, Budd goes crazy on the piano. Not to say he is channeling the spirit of Little Richard here, but he plays more notes in this one song than he has played on the rest of the album up to this point. It reminds me of something by George Winston, perhaps off his excellent December LP, that kind of calmly reflective yet joyous playing. Guthrie backs this up with some faint guitar, really just creating a haze and letting Budd do his thing. Radiant City features Budd playing something very tinkling, almost like a xylophone more than a piano. It echoes nicely in the guitar fog that Guthrie creates. On L'Aventure there is a faint bass rumble, and Guthrie's guitar steps out front, whirring in a slow hazy way while sparse piano notes echo. This trend continues in Smiling Apart, the guitar getting more and more focused. Finally, the record ends with Southern Shore, both instruments slowly gaining in intensity, not exactly becoming dense or overpowering, but perhaps forming a thicker haze than elsewhere on this record. The way that the song ebbs and flows reminds me, oddly enough, of the last Stars of the Lid LP -- this final song has that sort of "almost classical" feel to it. Overall, this collaboration seems more Budd than Guthrie to me. Budd's piano is the lead instrument much of the time, and Robin Guthrie is content to let that happen while he creates a lovely atmospheric background layer with his guitar. I have enjoyed Bordeaux tremendously, and find it a little more engaging than the other three collaborations that the two of them have released so far this century. Oddly enough, this is less focused and more ambient than those albums, but i think the two of them are at their best when they are making such calm, quiet music. Bordeaux clearly isn't for everyone, but if you like this kind of music, then you need o hear this.